As with any new device that hits, we’re always eager to see how it stacks up against the competition. 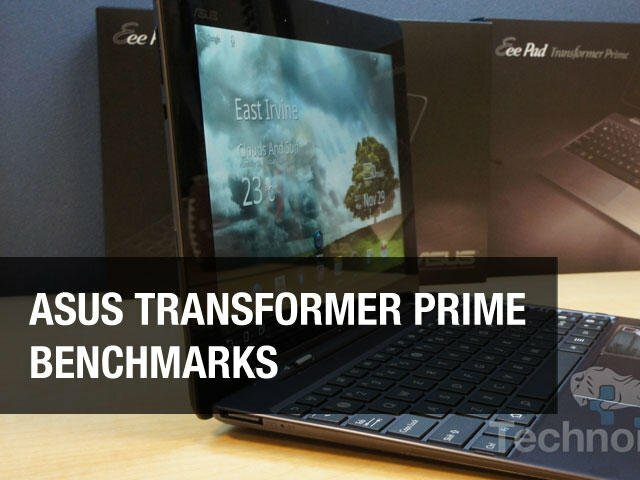 The Asus Eee Pad Transformer Prime is no exception. Ever since the tablet was unveiled, we’ve been waiting to see if the quad core Tegra 3-powered device is as fast as its specs would suggest. Asus claims it’ll get five times the performance of the original Transformer. So just how fast is it? 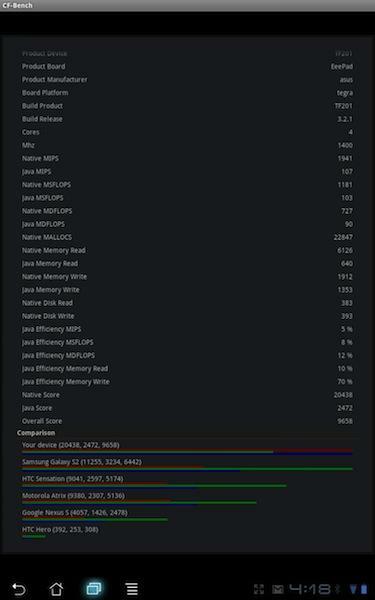 We put our TechnoBuffalo scientist caps on and lined up a few obligatory benchmark tests, including AnTuTu Benchmark, CF-Bench and NenaMark 2. One thing to note: A firmware upgrade hit the Prime yesterday, December 1, bringing the Build Number to HTK75.US_epad-8.8.3.27-20111122. Asus seems to be ironing out a few last minute bugs, so benchmark scores will likely change if more updates hit before Prime is released to the public. Once we spend more time with the latest build, we’ll be sure to bring you further coverage. Check out the screenshots to see how the Transformer Prime measures up. While it’s interesting to see the numbers, remember that they may not be 100 percent indicative of the overall experience. 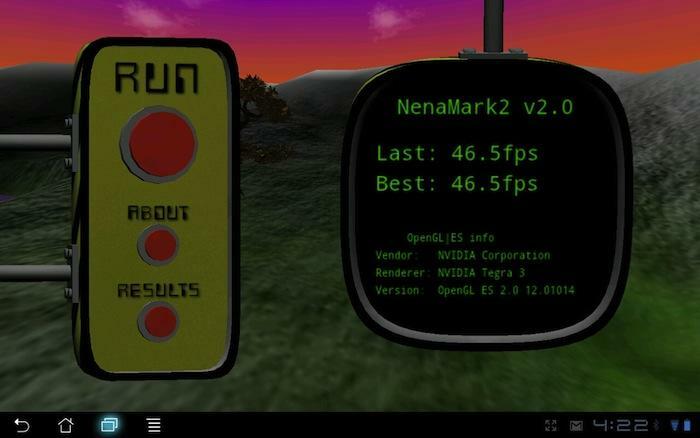 NenaMark2 is an OpenGL ES 2.0 benchmark that focuses on real-world GPU performance typically used by 3D games. As you can see, the Prime got a whopping 46.5fps, while Samsung’s Galaxy Tab 10.1 got a score of 18.6fps in comparison. 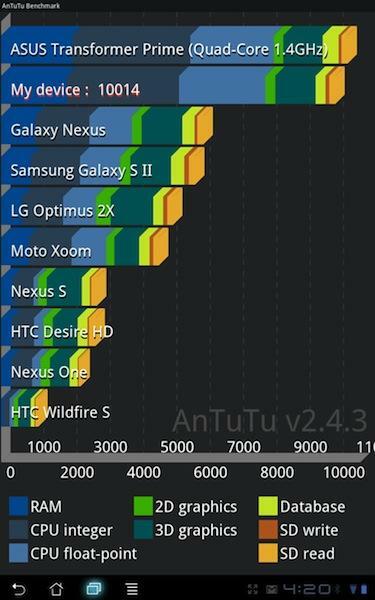 AnTuTu measures a number of key tests through memory performance. The Prime’s Tegra 3 is far and away above the pack, besting other devices in RAM, CPU integer and CPU float-point. We surmise the score above ours (My device: 10014) is an average of all Transformer Primes currently out in the wild. We ran the same test on the Galaxy Tab 10.1 and it slotted in just under the Moto Xoom (although it’s not shown in the shot above). 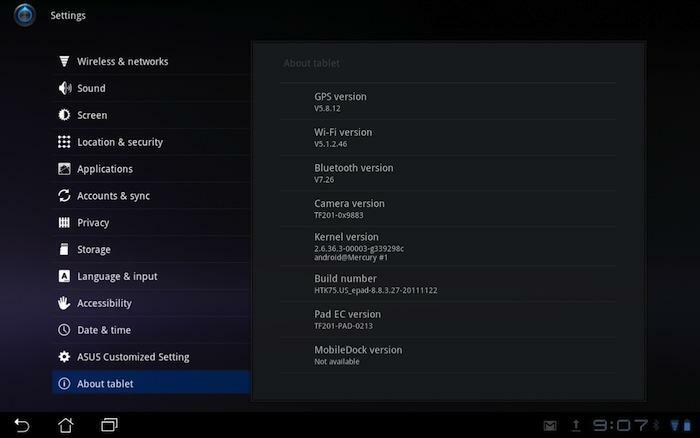 Screengrab showing Transformer Prime upgraded to the latest build. Anybody out there have an Android tablet and want to post your benchmark scores? The comments are open!